"The Brussels (or brussels) sprout (BrassicaoleraceaGemmifera Group) of the Brassicaceae family, is a Cultivar group of wild cabbage cultivated for its small (typically 2.5–4 cm or 1–1.5 in diameter) leafy green buds, which resemble miniature cabbages." I will tell you what I know about them without cheating and looking up facts. 1. 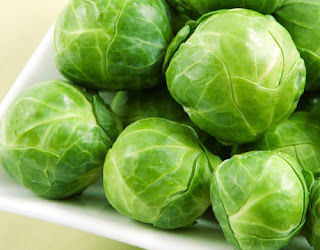 They are part of the cruciferous family of vegetables. That includes cabbage, and broccoli. What makes them cruciferous is that their parts cross over each other. Mainly their leaves. Cruciferous vegetables are big anti cancer foods. So EAT THEM!!! Here is Justin's recipe. Also I need to mention he has created it for a party of one, complete with music selection and wine pairing! Thanks Justin! 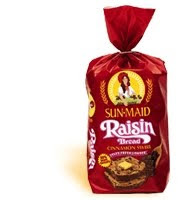 Sun Maid Raisin Bread with Cinnamon Swirl! It's an oldie but a goodie! This one is for Hiroko! 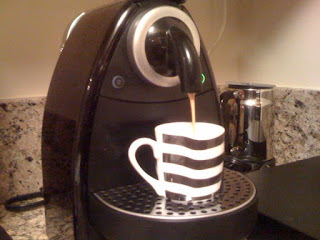 get one of these...Go.. Go get one right now!! Go go go go!! !You won't believe the amount of money you will save on Starbucks!! And not to mention it is the easiest thing you can do in your kitchen! Seriously check it out!! So yesterdays marathon tapas dinner was all made possible by stopping in one building. Yup! 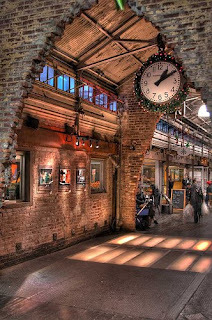 The Chelsea Market!. If you live in NYC I would find it had to believe that you have never been there. It is amazing! They have everything there. Wine shops, bakeries, produce markets, a restaurant supply store, the Food Network Studios.. I mean EVERYTHING! It is a huge complex where OREOS used to be made down in the Meatpacking District. If you haven't been yet PLEASE check it out!! Well tonight is my first attempt at cooking dinner and than blogging about it.. It was a fierce tapas party!! Shrimp, squid, ham, and pasta! What's better than that?? ?I have to say it was fun, and my husband and friends seemed to think so too. Now might be a good time to introduce myself... Hi, I'm Paul! My husband is Paul too, so get used to being confused. It doesn't matter anyway because this is about the food! We made a sick dinner tonight! It was a lot of work but anyone could do it. Just need a bit of time, patience, and love of course! If you don't want to put love in all the food you cook then stop cooking... no,seriously.. stop! Here are some pics of our first go! I hope you love it.. It is only gonna get better! Cheers to a good start! Thanks to Paul, Kristen, Anthony, Barry, and Ms. Megan Duffy for the help to get this thing going! To all the people who happen to read this in the beginning.... THANKS!!! Stay tuned to what's about to happen!!! Hey everyone! 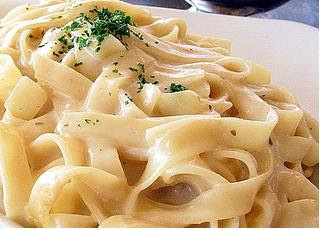 Welcome to the best food blog in the world. This is the place to learn how to cook your favorite dish, learn secret culinary tricks, share your ideas, and ask questions!